I have to admit to being only vaguely aware of Kinoshita Keisuke's Nijushi no hitomi [Twenty-Four Eyes] before the announcement of its UK DVD release by Masters of Cinema. As a confirmed devotee of Japan and its cinema, I realise I should have known all about the film and have seen it some time ago, but there are only so many hours in the day and so many films to see, and some of us have to make a living as well. And, of course, I'm English. I mentioned the title to a friend who grew up in rural post-war Japan and her eyes lit up. "You've got it?" she asked eagerly. 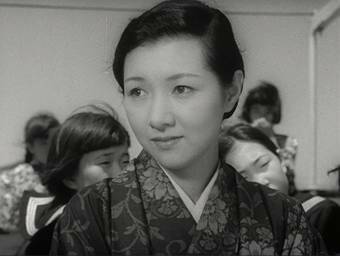 She knew Sakae Tsuboi's original novel well, and though she had never seen the film, she was aware of its fame. As well she might. Back in 1955 it won the Golden Globe for Best Foreign Language Film, and Kinema Junpo magazine selected it as the year's Best Film, beating – wait for it – Kurosawa Akira's Seven Samurai [Shichinin no Samurai] and Mizoguchi Kenji's Sanshô Dayû. That's right, the Japanese film industry believed it was an even better film than Seven Samurai, one of my very favourite films of all time. How the hell is it that I hadn't seen this before? Set on the inland sea island of Shodoshima, the story kicks off with the arrival of new schoolteacher Oishi to an isolated coastal village. Treated with contempt by the older locals for her city-influenced clothing and because she rides a bicycle, (necessary to cover the considerable distance from her home to the school in which she has been engaged to teach), Oishi nonetheless quickly connects with the young students, who soon become devoted to their new teacher. Watching the film with my friend was a surprisingly touching and, for her, nostalgic experience. She sang merrily along to all the children's songs and even supplied words for several of the instrumental pieces. She recognised many of the activities and pointed frequently at the screen with the delighted cry "I used to do that!" She also provided an insight into scenes that, as a western viewer, I would otherwise not have fully appreciated. A good example is the sequence in which the children are being taught the musical scales by Oishi's more old-fashioned employer. In an attempt to provide an English equivalent for the spoken (or rather sung) Japanese, the subtitles translate "hi hi hi, fu mi mi mi, ii ii ii mu ii" as the more familiar "doh doh doh, rei mi mi, so so so lah so" But it is the teacher's refusal to use this globally accepted western equivalent that is key to the scene – it is of English origin, not Japanese, and therefore at this time and in this community is something to be rejected. It is this very attitude, of course, that prompts the initial hostility to Oishi on her arrival in the community, dressed in western-style clothing and riding a vehicular import, a reflection of pre-war rural frustration at the encroachment of western values into Japanese society, something that had already taken serious root in the cities and larger towns. 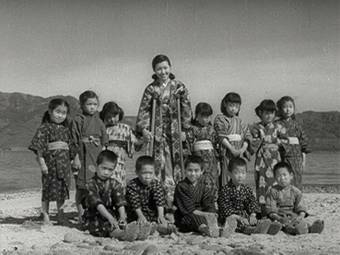 The children have yet to learn such judgemental attitudes, and Oishi is able to communicate with them almost from the moment she steps into the classroom, encouraging a lively response to questions, leading them in outdoor sing-alongs, and calling them by their nicknames, which she writes in the attendance register. But what starts as a tale of an outsider's battle against small town prejudice soon considerably widens its scope and thematic concerns. The relationship between Oishi and her students is used to examine Japanese social and political history in the period leading up to, during, and immediately following the Second World War. The children in particular are at the core of this and are in the first half just about the only characters photographed in close-up, something Kinoshita uses beautifully to connect us to them as individuals. These young hopefuls represent both traditional thinking – the boys who dream only for fighting for the Emperor – and the changing times to come, as with the girl who writes in her 'Hopes for the Future' essay of a Japan in which women have regular jobs and by association equal standing with their menfolk. In this telling scene one girl is unable to write anything at all, as imminent bankruptcy has left her family bereft of hope. Fate certainly deals all of them a tough hand in these turbulent times, as one girl falls victim to tuberculosis, another is sold by her family into servitude on the mainland, and a third leaves the island when their family is evicted. The boys fare no better. Enthusiastically going off to war to fight for their emperor, not all are destined to come back alive, and one of them returns robbed of his sight. Oishi is equally fated. Accidentally injured by a backfired student prank, she is instantly disconnected from her job and her students through her inability to ride her bicycle to the school. She later takes up teaching again at the larger consolidated school, but by now is becoming disillusioned with her profession, almost branded a communist for attempting to widen her students' knowledge of politics, and a coward for her dismay over young lives wasted by war. Although she verbally protests, she remains effectively powerless throughout, anguishing over events that she is unable to prevent or affect. The authenticity of the activities which my friend so cheerily recognised is perhaps counterbalanced a little by some artistic licence when it comes to the portrayal of Oishi. Sato Tadao, generally regarded as Japan's foremost film critic (and the one Joan Mellen references in the accompanying booklet), described her as "an idealisation" and says "I can't remember any primary school teachers like Miss Oishi. Even if any such people had really existed then, they would probably have been forced to resign. "* Not that this really matters. Oishi is very much a post-war creation, a symbol of a strong pacifistic element in Japan that was opposed to rearmament, but also a voice that speaks for a generation of young men lost to war, and a plea for peace to present and future societies. But there is still a so much here to admire and enjoy, not least in the quality of the film-making and the scope of the story, which provides a fascinating insight into a pivotal moment in Japanese history, albeit from a post-war, humanist perspective. There are some beautifully handled scenes, most of which involve the children at various stages of growth and development, from the editorial linking of names to faces when Oishi looks over the children's calligraphy, to the long walk the pupils embark on to see their injured teacher, a demonstration of their unity and fortitude that ultimately results in Oishi's acceptance into the community. The island landscapes, often gorgeous in themselves, are as much a character in the film as any of the children, and are as crucial to the narrative as the dried fields, narrow paths and open waterways of Shindo Kaneto's The Naked Island, and scene after scene demonstrate Kinoshita's extraordinary eye for composition and camera placement, and his understanding of the power and pace of editing. For the most part Twenty-Four Eyes is handsome cinema, an involving, ambitious and sometimes strikingly made work that is both epic in reach and intimate in approach, but whose effectiveness as a tear-jerker will depend on your reaction to the surplus of in-film expressed emotion. But better than Seven Samurai and Sansho Dayu? Not quite, at least in my book. It is nonetheless still held in extremely high regard in its native Japan and in 1999 was selected by Japanese critics as one of the ten best Japanese films of all time. I'll thus let my friend have the last word on a work that she was able to relate to so much of. "It was a really nice film," she told me, "but I still preferred the book." Ain't that so often the way. Of all their recent DVD releases, it's the ones sourced from the Shochiku studio that seem to have given Masters of Cinema the biggest headaches, in the main because of what seems to be the shoddy condition of the prints they have been given to work with. Twenty-Four Eyes is in some ways no exception, with a great deal of visible wear and tear, print damage and brightness instability. There are scratches and dust all over the place, but – and this is a notable but – there has been a commendable attempt to reduce the visibility of these imperfections, and a largely successful one – although still present, they are nowhere near as distracting as you might think. This is due in no small part to the transfer's surprisingly fine level of detail and sharpness and generally excellent contrast, lifting the picture quality well above those on the MoC discs of Scandal and The Idiot. There are a couple of night scenes in which the black levels turn decidedly grey, but on the whole this is a very pleasing restoration of seriously imperfect source material. The mono soundtrack shows its age, being a little fluffy in places and accompanied by a little background hiss, but is otherwise clear and free of alarming pops. Only one on the disk itself, and that's a Gallery of original Shochiku promotional material, and it's a substantial collection, being something like 60 production photographs, all in fine shape and all reproduced at a decent size. No Masters of Cinema release would be complete without an accompanying Booklet, which here is of the usual high standard, featuring quality reproductions of stills from the film and a sizeable essay by Joan Mellen, who is clearly a huge fan of the film and covers it in impressive detail. She is not as smitten by the book as my friend, it has to be said, though does usefully highlight some of the key differences between it and the film. Subjective issues of sentimentality aside, this is a hugely impressive work that has never been made available for home viewing in the UK before, and so this DVD release is particularly welcome. 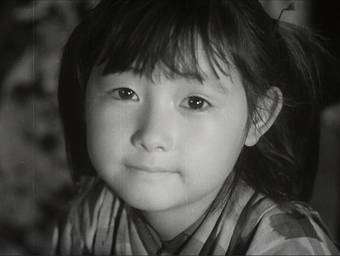 It should be essential viewing for anyone interested in classic Japanese cinema, or just great cinematic storytelling. And let's face it, not everyone is as cynical about cinematic tearjerkers as I am, and judging from reaction across the web there's a not unreasonable chance that by the end you may have a handkerchief to your face and be trying to convince those around you that you have something in your eye. Masters of Cinema have worked small wonders with what is obviously a less than ideal print, and despite the print damage the contrast and detail are very good. Not many extras, but the disc still comes warmly recommended. * Currents in Japanese Cinema by Sato Tadao, translated by Gregory Barrett, 2nd printing, published by Kodansha International Ltd, 1987.